Small Business/Minority Expo in partnership with the Potts Entrepreneur-Incubator Technology Center of Greater Lima-Northwest. 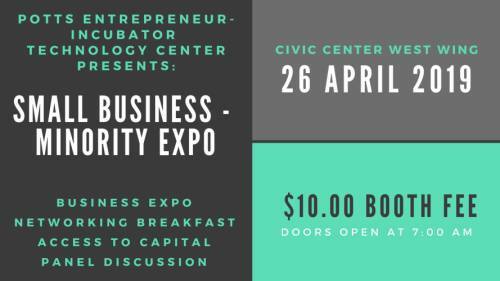 The Small Business-Minority Expo is being held at the Lima Memorial Civic and Convention Center in concert with the Lima/Allen County Chamber of Commerce Real American Sunrise monthly breakfast meeting (formerly Wake, Rattle & Roll). Immediately following the breakfast, attendees will be invited to the Small Business -Minority Expo to visit booths from 8:30a - 10:30 am. Then, at 10:30 am, there will be an hour-long panel discussion and Q&A session to educate booth participants and public attendees on how to gain "Access to Capital". This is a GREAT opportunity for you to network and continues showcasing your product and/or service to the public for just $10.00.